SEALs, or Navy Special Warfare Operator (SO), as they are now officially called, are named after the environments in which they operate, the SEa, Air, and Land. SEALs are the foundation of Naval Special Warfare combat forces. Since 1962, when the first SEAL Teams were commissioned, Navy SEALs have distinguished themselves as individually reliable, collectively disciplined and highly skilled warriors. SEALs perform Special Operations missions from fixed-wing aircraft, helicopters, ships, and submarines. They may be exposed to arctic, desert or jungle environments including survival in enemy controlled areas and all water conditions. They may also perform administrative and foreign training missions in a wide variety of climates throughout the world. SEALs go through what is considered by many to be the toughest training, both physically and mentally, among any military unit in the world. After completing basic training, these sailors take the SEAL Preparatory Course at Great Lakes, Illinois for up to 4 weeks. Next is Basic Underwater Demolition/SEALs training for 26 weeks at the Naval Special Warfare Training Center in Coronado, California. That's followed by 3 weeks of Basic Airborne Traning at Fort Benning, Georgia and 13 weeks at the Naval Surface Warfare Center in Panama City, Florida for small battery powered wet submersibles (SDV) training. Once they've successfully completed (and not everyone does) BUD/S, and basic airborne training, graduates are assigned to SEAL and SDV Teams where they gain on-the-job experience as members of operational platoons/detachments. You'll need a combined score of 165 on the verbal (VE), general science (GS), mechanical comprehension (MC) and electronics information (EI) on the Armed Services Vocational Aptitude Battery (ASVAB) tests. SEALs conduct highly sensitive missions, and if you want to be part of this group you need to be able to qualify for a secret security clearance from the Department of Defense. Generally, a history of drug use is disqualifying, as are some medical and mental health conditions. If you have a criminal history, you'll need to obtain a waiver. You'll also need to be a U.S. citizen and have normal color perception. There's also an age cutoff for new SEALs: You have to be under age 29 when you join. Those who volunteer under the SEAL Challenge program at the time of enlistment and those who volunteer during Navy Basic Training do not have to meet the above physical fitness standards at the time of application. However, they must meet similar standards before they can graduate from the SEAL Prep Course, prior to attending BUD/S. The Naval Special Warfare community is a sea-intensive community. 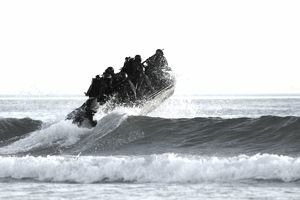 Due to the unique nature of the special warfare mission, sailors in the elite communities of Navy Special Warfare Operator (SO) and ​Naval Special Warfare Boat Operator (SB) should expect to serve back-to-back sea tours prior to assignment ashore.